2013 will definitely be remembered as the year of 'the Apple' for me. I've become one of those people with an iPhone, iPad, Macbook and for my birthday back in April I received Apple TV. I must confess that it was simply requested for want of anything else at the time and having all so many other Apple products it was next on the list. My brother and his family absolutely raved about it and I was in a habit of watching Netflix on my iPad so it made sense to be able to watch on a TV screen. More recently I've been using Apple TV to watch YouTube and all the usual tutorials and hauls and recently so so many Vlogmas 'episodes'. I thought I'd give you a little rundown of how I use my Apple TV as it might not be too late for some of you to get a letter off to Santa or it's a great gift idea for a member of your family. Firstly like most Apple products it is a dream to set up but do remember the HDMI cable which you have to buy separately - why do companies do this? It's like selling something without a plug. Luckily I'd done some investigations and instructed those buying for me to buy the cable somewhere other than the Apple store as they naturally charge a premium and any cable will do. On opening your Apple TV it's simply plugged into the mains and then your HDMI into the chosen TV. I decided on using this in my bedroom as I already had Sky in the front room and only tend to sit in front of a TV and watch a film when relaxing in bed. Next you log into your iTunes/Netflix/YouTube accounts. iTunes is fairly simply and suddenly you can listen to your iTunes library through your TV. Recently my brother and I brought Apple TV for my parents as they do not have Sky and don't want to go through the upheaval of having wires and a satellite dish but miss out on a lot of great tv shows that you can catch up on Netflix - we included a years subscription for that too. It took somewhat longer to create the account in this instance but if you already have one it's minimal effort. Logging into my YouTube account was a little more stressful as mine is linked to my Google profile and it took some searching on forums for the instructions to get this working correctly. For info I could still access YouTube just not from my specific account. As I mentioned I subscribe to a number of people on YouTube and recently discovered the 'watch later' option (I'm new please forgive my slowness) which essentially creates a playlist and when I retire to bed I pop them on to watch and find I can easily drift to sleep listening to someones recent favourites - and then dream about blush and body lotion. Netflix I'm sure we all know about and if you're a regular user I'd highly recommend Apple TV for watching on - much better than small laptop screens. Currently I've managed 2 episodes of Breaking Bad and I just can't get on with it but I plan to preserve and there's so many other shows and films that are on my list to get through. There are also other services which I am ashamed to admit my 5 year old nephew introduced me to. I was happy enough with my music, YouTube and Netflix, then he showed me Vevo the music channel (complete with his accompanying Katy Perry to Roar) and more randomly the Trailers channel - which is literally all trailers for upcoming films. Sports fans can enjoy NBA, NHL and purchase viewing of Sky Sports channels and there's even access to your Flickr account. All in all this is one of the best gifts I've ever received and likewise for my parents who are not the most technologically minded. My dad scoffed when we purchased this for my dad but he looks on YouTube from his laptop and loves an old Western so he is suddenly very enthusiastic about using Apple TV and as I said if you can't afford or accommodate Sky this is a great option to expand your TV schedule. So this is my top non beauty related birthday gift idea, it's a pricey one but well worth every penny and great for young and old alike and maybe perfect for the man in your life as I know from last nights #fblchat there were a lot of people struggling for ideas. 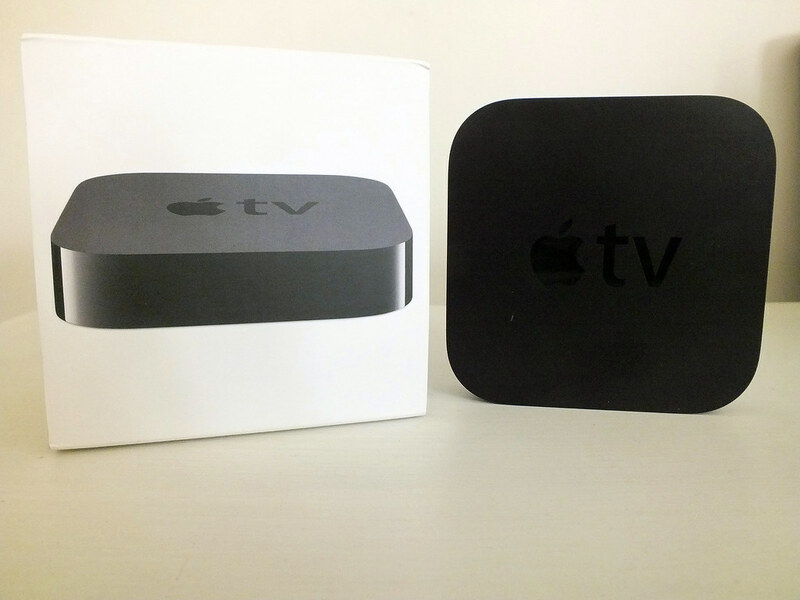 Are you an Apple TV user or tempted by one, let me know in the comments. I have an Iphone and I am considering buying an mac but I have only had my Sony vaio for 4 months and already I love the touch screen so couldn't part from it! I do like the idea of Apple tv, having everything in one place! I love the idea of this, I'll look into it certainly! I bought my boyfriend one a little while ago and he loves it. I really like watching YouTube videos through it. Handy little thing!